HUGE SAVINGS vs. OEM PRICING!!! Innovative Endoscopy Solutions, Inc. offers OR Table Pads, Stretcher Pads & Birthing Mattresses designed to fit all major manufacturers such as AMSCO/STERIS, SKYTRON, STRYKER, HILL-ROM, GETINGE, MIDMARK, BERCHTOLD, TRUMPF, MAQUET, HOLOGIC, AMATECH and more. 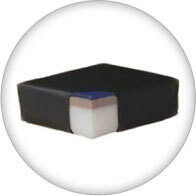 Medium density polyfoam only with a 3-ply vinyl cover on all sides. 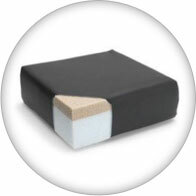 Medium density polyfoam only with a urethane coated 4-way stretch cover on the top and sides with the 3-ply vinyl material as the bottom cover. 0.50” top layer of Viscoelastic (memory) foam with the medium density polyfoam base; urethane coated 4-way stretch cover on the top and sides with the 3-ply vinyl material as the bottom cover. A 0.25” layer of polymer gel is added to the top of the foam configuration. The urethane coated 4-way stretch material is used on all sides and the seams are ultrasonically welded to prevent fluid ingress (there will be one sewn and sealed “closing seam” on each individual pad). 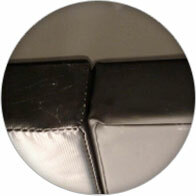 (Sewn” seam seen on “left” vs. “welded” seam on “right” in photo below. 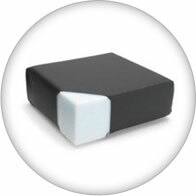 PAD THICKNESS: Pads can be manufactured to 2", 3", or 4" thicknesses or can be manufactured to specifications. Visit the About Us page and fill out the form at the bottom of the page to request more information about equipment. You can also contact us at 817-514-6725 or email at info@iendosolutions.com for more information.